What makes LEDs an excellent source of light? Extensive literature exists on the technical aspects of LEDs, including reviews of the various substrate materials available, analysis of the crystal growth of the materials that emit light, the preparation of the diodes and the assembly of heat sinks to properly optimize the thermal properties by these powerful sources of light. LEDs are low voltage devices, so for retro-fit applications, one must consider obtaining the correct operating voltage and direct current to power your LEDs properly. New designs can address low voltage directly, which offers additional safety and cost savings. LEDs are very low heat emitters making them economical. Reduced heat saves on venting, fan and power costs as well as air conditioning expense. Retail establishments, restaurants, factories, galleries and museums all benefit from lowered utility costs! Additionally JKL Alumiline LEDs have no ultraviolet (UV) emissions which make them ideal for illuminating delicate textiles, paintings and artifacts in a museum or gallery setting. 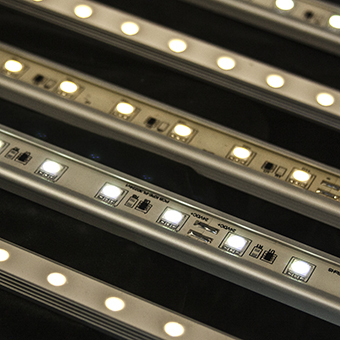 LEDs are long life devices, making them ideal for minimal maintenance and upkeep. Incandescent and fluorescent lighting technologies need frequent replacements which requires additional cost and effort. LEDs are small in size, permitting their use in narrow spaces or small areas that were once incompatible for traditional lamps fixtures and sconces. LEDs are rugged and tough – no filaments to break, no disposal issues and these lightweight and design-flexible powerhouses offer a very small environmental impact.